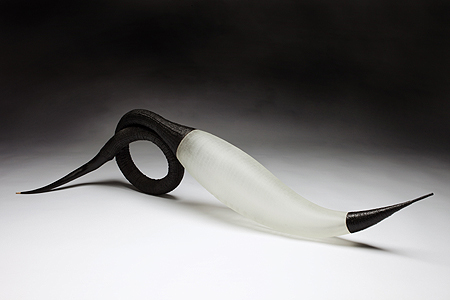 Kirra Galleries will launch its 10th season of exhibitions at Federation Square with new works from two of Australia's most exciting glass artists, Harriet Schwarzrock, based in Queanbeyan, New South Wales, and Tevita Havea from Sydney. The exhibition titled 'OSMOSIS' opens on Thursday 1 March 2012. 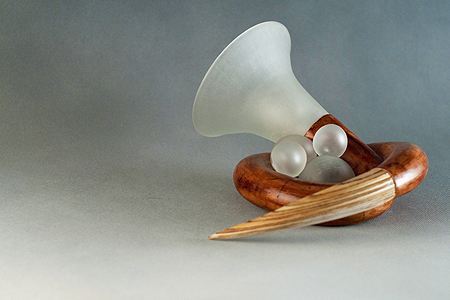 Please join us on Thursday 1 March 2012 from 6.00pm to 8.00pm for the opening reception of "OSMOSIS", meet the artists and view the spectacular glass sculptural forms on display. 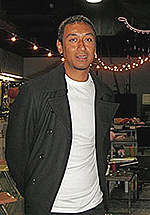 Since graduating from the Australian National University School of Art in 2005, Tevita has gained recognition in both Australia and the USA for his innovative work influenced by the cultural environment of his native Tonga. He is one of Australia's foremost emerging artists with a distinctive style using blown glass, woven twine and carved wood to convey the customs and culture of his ancestors in a contemporary style. 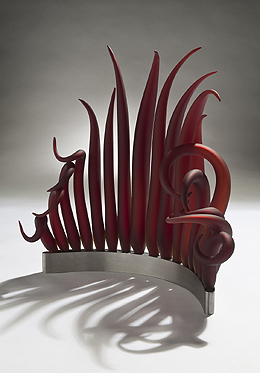 In 2007 a piece of his work was purchased by The Corning Museum of Glass and in 2009 he received The New Talent Award from Urban Glass New York and was a finalist in The Ranamok Glass Prize, a travelling exhibition of Australian and New Zealand glass artists. Tevita Havea's work is a lyrical interweave of Polynesian mythology, custom and creation stories; stories about regeneration and the symbiotic relationship between the feminine and masculine. Often I am humbled by the fascinating rhythms and interconnectedness of organisms. I endeavor to present sculptural forms that allude to this inter connectivity. Here similar organically inspired elements align and effect those adjacent. It is my intention that the molten plasticity of this diaphanous material provides a shifting cadence, whilst allowing for the interplay of the spaces between. Elementally, Schwarzrock's current body of work is derivative of singular cellular forms and their varying structures. The intrinsic complexity of growth and natural forms is a vast field from which Schwarzrock draws inspiration. 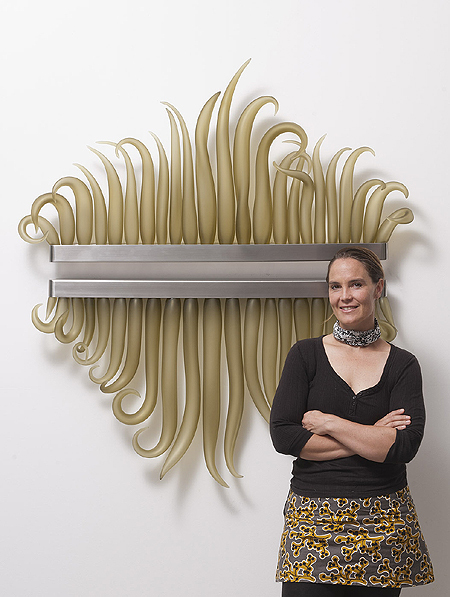 She works with repetitive blown glass forms and stainless steel in order to create wall panels and larger sculptural forms, enabling basic components to amass and become multifarious formations. Subtle shifts and individual differences inform the placement of the forms, with the intention to create an ambiguous floating feel within the structures. Shifting technologies and expanding scientific understanding expose beautiful and at times random interconnectivity. Such themes of interconnectivity and interdependence are a recurring thread within Schwarzrock's practice. and Schwarzrock share a studio in Queanbeyan, NSW, Australia, where they run a glass furnace in which they often tint the molten glass to create varied colours and hues. Schwarzrock studied in the glass studio at Sydney College of the Arts in the 90's, and was fortunate to have artists such as Elizabeth Kelly, Matthew Curtis, Ben Edols and Kathy Elliott teach classes in the hotshop during this period. Perhaps most formative during Schwarzrock's studies was an opportunity to travel to North America to work with and assist both Laura Donefer and Stephen Powell in their varied studio glass practices. Schwarzrock claims that she is fortunate to have a wonderful partner and a rambling studio to experiment and work in. 'Osmosis' Exhibition - opening Thursday 1 March 2012.